One of my favorite things to do with a class is to read them a story. I use stories as a way to introduce myself and to share an important key message about nature and our connection as people to nature. Stories enable children to get hooked and become engaged in a program. This month I would like to share with you three storybooks that I read in my workshops to spark nature connection. These stories help share a message about sustainability, local ecosystems and the importance of environmental stewardship. 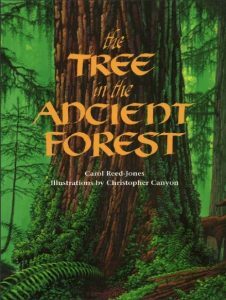 “The Tree in the Ancient Forest” written by Carol Reed-Jones and illustrated by Christopher Canyon is a beautiful story about the interdependence of the plants and animals that live in old-growth forests. Students are reminded of their own dependence upon nature and the importance of preserving and respecting living things. I have a lot of fun reading this story because of its rhyming and repetitive word patterns. It allows the students to join in the story and follow along in a fun and interactive way. I highly recommend this book to any classes that are learning about relationships between species in their local ecosystem. “The Little Hummingbird” written by Michael Nicoll Yahgulanaas is an Indigenous story about a little hummingbird that is doing its best to take care of its home. Children love this story because it is so simple and leaves them feeling empowered. They understand that more than likely the little hummingbird was probably not able to put out the fire alone, but the fact that little hummingbird did something at all is what is most important. Children feel a strong connection to animals and compassion for them. 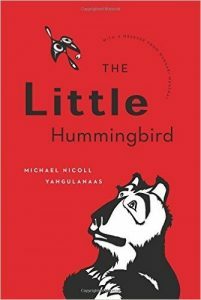 They see themselves in this story as the little hummingbird and wonder what they would have done in this situation. I always ask them what they believe the lesson is from the little hummingbird and they come back with the same answer every time: “it doesn’t matter your size, we all can make an impact, so always do your best to protect your home.” I recommend this story to anyone who needs a simple reminder of the importance of always doing your part to protect the environment. 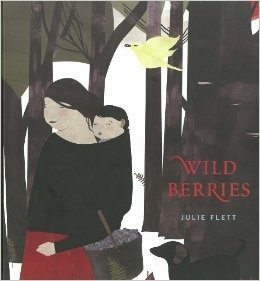 “Wild Berries” written and illustrated by Julie Flett is a lovely Cree storybook about a grandmother and grandson going out to pick wild blueberries. This story really ties in well with our “Going Wild! People & Plants” program. The key message delivered in this book is about sustainability. It reminds us of those special moments when we truly make a connection out in nature. While the story takes you on a small journey about going out to pick wild berries, it really draws on the connections that are developed over time between people and the land. Students are able to easily relate to the story because it is simple and clear about how they too can make connections with all living things in nature. I highly recommend this story to everyone who loves picking and eating wild berries.